The latest GenX cylinder heads are flowed, installed and topped off with multi-port fuel injection before being dyno tuned on pump gas. PowerNation's Iron Animal 408 Turbo Giveaway Sweepstakes features an LS stroker engine that is capable of producing 850 horsepower and 900 ft. lbs. of torque! The foundation for this project was a fully-machined, 6-liter iron block with parts coming from Summit and Trick Flow, making this performance bad boy worth $20,000! Click the "ENTER THE GIVEAWAY" link for your chance to win the sweepstakes. SHOWN YOU LOTS OF OPTIONS IN THE PAST. PULL ONE OUT OF THE BONE YARD, BUY A FACTORY CRATE ENGINE, OR TODAY'S OPTION, BUILD ONE FROM SCRATCH OUT OF A CATALOG. PLUS A BEHIND THE SCENES LOOK AT ARP FASTENERS. (MIKE)>> LISTEN UP LS FANS. TODAY ON ENGINE POWER WE'RE STARTING THE BUILD UP OF OUR VERY FIRST 408 CUBIC INCH LS STROKER THAT'S GOING TO MAKE 1,000 HORSEPOWER. 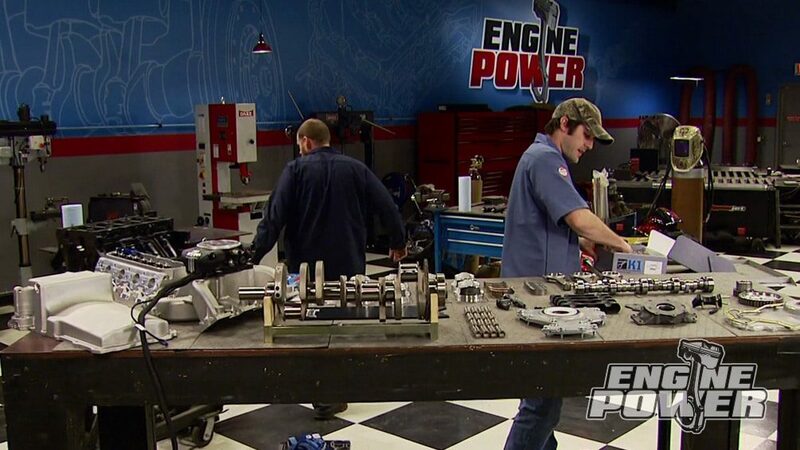 NOW WE'RE GONNA SHOW YOU THE TIPS AND TRICKS TO MAKING BIG HORSEPOWER AND EXTENDING THE LIFE OF THE ENGINE IN A THREE SHOW BUILD. NOW THE FOUNDATION FOR THIS PROJECT IS A FULLY MACHINED SIX LITER IRON BLOCK, AND EVERY SINGLE PART USED CAME MAIL ORDER FROM THIS CATALOG. 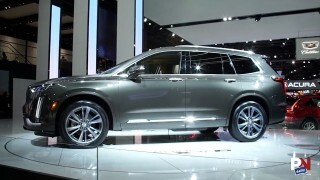 (JOHN)>> WHEN GM CAME OUT WITH THE LQ FOUR ENGINE, THEY USED IRON HEADS FOR THE FIRST TWO YEARS, WHICH WERE 1999 AND 2000. THEN THEY WENT OVER TO AN ALUMINUM HEAD. NOW ALL LQ FOUR ENGINES HAD A NINE POINT FOUR TO ONE COMPRESSION RATIO USING A DISH PISTON. BY NOW THEY'RE ALL OVER THE SCRAP YARDS TOO, AND PRETTY INEXPENSIVE FOR SUCH A STRONG BLOCK. (MIKE)>> ALSO POPULAR IS THE LS ONE FROM 1997, A FIVE POINT SEVEN LITER FOR CORVETTES. THE LS TWO FROM 2005 IS A SIX LITER FOR CORVETTES AND GTO'S. THE LS THREE OF 2008, AGAIN FOR CORVETTES AND LATER THE CAMARO. AND THERE WERE PLENTY OF LS'S IN BETWEEN. (JOHN)>> NOW THE PARTS LIST FOR THIS BUILD WE CAME UP WITH OFF OF SOME OF THE OTHER ENGINES WE'VE BUILT THAT WE'VE HAD SOME GOOD NUMBERS ON, AS WELL AS SOME OF THE LATEST AND GREATEST HEADS THAT TRICK FLOW OFFERS. NOW THE GOAL FOR THIS THING IS VERY SIMPLE, 550 HORSEPOWER NATURALLY ASPIRATED ON PUMP GAS. NOW IT'S A STROKER, SO WE WANT A BROAD TORQUE BAND. WE WANT FROM START TO FINISH TO ALMOST BE A STRAIGHT LINE ON THE DYNO GRAPH. NOW WE ALSO ARE GOING TO PUT THE WOOD TO THIS THING LATER WITH A BIG TURBO GOING FOR 1,000 HORSEPOWER. AND ONE OF YOU LUCKY VIEWERS IS GONNA GET A CHANCE TO WIN IT BY HEADING OVER TO POWERNATION TV DOT COM AND SIGNING UP. (MIKE)>> PART ONE OF THIS BUILD WILL COVER THE ENTIRE SHORT BLOCK, STARTING OFF WITH SOME INEXPENSIVE TRICKS TO THE BLOCK THAT WILL HELP EXTEND ITS LIFE ALONG WITH THE PARTS THAT GO IN IT. LIKE THIS FORGED KONE ROTATING ASSEMBLY, A MELLING HIGH VOLUME OIL PUMP, TRICK FLOW CAM SHAFT AND LIFTERS, PLUS A HOLLEY OIL PAN AND OIL CONTROL BAFFLE. (JOHN)>> THIS IRON SIX LITER BLOCK IS THE PERFECT FOUNDATION FOR THIS BUILD. IT'S BEEN SEASONED AND HAS A FINISHED BORE OF FOURZERO-30 INCHES. NOW THE BLOCK IS FACTORY PREPPED WITH SIX BOLT MAIN CAPS. IT COMES WITH THE CAM BEARINGS AND FREEZE PLUGS INSTALLED, AND CAN ACCEPT UP TO A FOUR INCH STROKE WITH NO CLEARANCING. 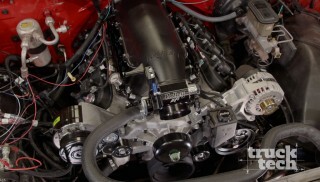 NOW THE BIG EYE OPENER TO THIS PROJECT IS THE FACT THAT SUMMIT RACING RATES THIS BLOCK AT 1,400 HORSEPOWER. THAT MEANS ALL POWER ADDERS ARE WELCOME, ESPECIALLY THAT TURBO WE'VE GOT COMING. NOW TO GET STARTED WE REALLY DON'T NEED A LOT. JUST A DIE GRINDER, SOME CARTRIDGE ROLLS, SOME METRIC TAPS. REMEMBER THIS THING'S METRIC NOW, AND A COUNTER SINK. DEBURRING A BLOCK IS REALLY SIMPLE. WE'VE SHOWN IT TO YOU MANY TIMES ON SEVERAL DIFFERENT ENGINES. ALL WE'RE REALLY DOING HERE IS REMOVING ANY SHARP EDGES SO THAT THEY'RE ALL SMOOTH. NOW THIS HELPS MAKE THE BLOCK A LITTLE BIT STRONGER BY REMOVING ANY STRESS RISERS. DOING THE SAME THING IN THE LIFTER VALLEY WILL ALSO HELP OIL DRAIN BACK TO THE PAN JUST A LITTLE FASTER. NOW THIS IS CHEAP INSURANCE THAT WILL EXTEND THE LIFE OF AN ENGINE. AND TO MAXIMIZE THE EFFECT, SMOOTH IT SOME MORE WITH A CARTRIDGE ROLL. (MIKE)>> ANOTHER THING WE LIKE TO DO IS RUN A TAP THROUGH ALL THE BOLT HOLES. THIS WILL MAKE SURE THEY ARE ALL CLEANED OUT FROM THE SHOT PEENING PROCESS. THIS IS SOMETHING WE HIGHLY RECOMMEND. PLUS IT WILL INSURE WE GET A GOOD CLAMPING FORCE WHEN WE TIGHTEN THE BOLTS LATER. DUE TO THE HORSEPOWER WE'RE GONNA MAKE WITH OUR TURBO, WE CAN'T RELY ON THE FACTORY MAIN BOLTS TO HANDLE THE EXTRA STRESS. AND YOU JUST CAN'T SWAP OUT THE BOLTS FOR STUDS BECAUSE IT CHANGES THE LINE HONE, AND WE CAN PROVE IT. BACK OUT FOR YOU. THAT'S WHAT I'M GONNA TAKE CARE OF. SO WHEN WE GET BACK WE CAN FINISH UP. SIX BOLT MAIN CAPS KNOWS THEY'RE A BEAR TO GET ON AND OFF, ESPECIALLY WHEN YOU INSTALL STUDS. NOW THERE ARE SOME SPECIALTY TOOLS OUT THERE FOR GETTING THESE MAIN CAPS OFF, BUT LET ME TELL YOU, THEY ARE EXPENSIVE. SO I'VE GOT A CHEAP AND EASY TRICK I WANT TO SHOW YOU THAT I USE, HELPS GET THESE THINGS ON AND OFF EASY, WILL SAVE YOU A BOAT LOAD OF CASH. AND ALL WE'RE GONNA USE IS A PUNCH, A DRILL BIT FOR A QUARTER-20 TAPE, AND A SLIDE HAMMER OF SOME SORT. THE PUNCH IS TO KEEP THE BIT FROM WALKING. THEN WE CAN DRILL A HOLE INTO THE MAIN CAP JUST DEEP ENOUGH TO CUT A FEW THREADS. NOW USING SOME WD 40 AS LUBE, TAP THE HOLE MAKING SURE TO KEEP IT STRAIGHT. OUT OF THE HOLE. THEN RUN IN YOUR QUARTER-20 BOLTS AND ATTACH YOUR SLIDE HAMMER TO THE BOLT AND PULL IT OUT. AND IT CAN BE THAT EASY. (MIKE)>> WHEN JOHN FINISHES UP THOSE MAIN CAPS, I'M GONNA TAKE CARE OF AN IMPORTANT OILING MODIFICATION TO THE INLET AND OUTLET PORTS ON THE BLOCK AND THE OIL PAN. NOW IT'S A SIMPLE PROCESS THAT WILL IMPROVE OIL FLOW. THESE PORTS HAVE A HARD, SHARP EDGE. MUCH BECAUSE IF YOU DO YOU'LL GO RIGHT THROUGH THE CASTING. THAT SMOOTH PATH WILL HELP EXTEND ENGINE LIFE, LESSEN BEARING WEAR, AND HELP THE SYSTEM OIL THE TURBO WHEN WE ADD IT, EXACTLY WHAT THIS 408 NEEDS. SINCE THE OIL PUMP IS THE HEART OF THE ENGINE, WE WANT IT TO PERFORM BETTER THAN NEW. NOW TO MAKE SURE OF THAT, WE'LL GET RID OF THESE EDGES SO THE OIL FLOWS FASTER AND HAS AN EASIER PATH. A SMOOTH RADIUS TO PROMOTE FLOW. KEEP OIL ON THE WALLS AND ALLOW BETTER LUBRICATION TO THE SKIRTS. (MIKE)>> WE'RE DONE WITH THE GRINDERS AND IT'S OFF FOR ITS FINAL WASH.
(ANNOUNCER)>> DID YOU EVER WONDER HOW ARP GIVES THEIR FASTENERS SUCH RACE WORTHY STRENGTH? JOIN US FOR A BEHIND THE SCENES TOUR OF THEIR FACILITIES AND SEE FOR YOURSELVES, STAY WITH US. STRONGER, MORE RELIABLE STUDS AND BOLTS FOR RACE ENGINES. SINCE THEN AUTOMOTIVE RACING PRODUCTS HAS GROWN FROM HIS GARAGE TO A WORLD FAMOUS COMPANY. GARY'S SON MIKE IS NOW IN CHARGE OF ARP OPERATIONS WHERE ALL THEY DO IS MAKE PRECISION EXTREME STREET FASTENERS. AN INTRICATE PAIN STAKING PROCESS ALL IN HOUSE AT THEIR CALIFORNIA COMPLEX. (JOE)>> HERE'S WHERE IT ALL STARTS WITH MILES OF 8740 CHROMOLY COILS. AFTER THE COILS ARE STRAIGHTENED, ARP'S PROGRESSIVE FORGING STARTS WITH COLD HEADING. (CHRIS)>> AND IT TAKES THE RAW COILS AND ACTUALLY DOES THROUGH A SERIES OF CUTTING, UPSETS, AND FORMING, IT ACTUALLY MAKES THE HEAD ONTO THE BOLT. (JOE)>> FOR STUDS AND LARGER SIZE BOLTS 12 FOOT BAR STOCK IS CUT TO LENGTH. THEN SENT TO A HOT HEAD STATION LIKE THIS. TODAY VETERAN EMPLOYEE DANNY FERRARA IS FORMING HEADS ON HONDA BALANCER BOLTS. (DANNY)>> THIS ELECTRICAL INDUCTION HEATER WILL HEAT THE PART TO 1,850 DEGREES IN 15 SECONDS. I WILL THEN PLACE IT IN THIS LOWER DYE AND I WILL HIT THE PRESS AND IT WILL COME DOWN AND FORM THE PART. (JOE)>> HEAT TREATING IS PERHAPS THE MOST CRITICAL PRECISELY CONTROLLED PROCESS AT ARP. TEMPERATURES CAN REACH 1,800 DEGREES FOR QUENCHING AND TEMPERING. AGING TAKES UP TO 16 HOURS, ALL IN VERTICAL RACKS THAT HOLD EACH PIECE INDIVIDUALLY FOR COMPLETE PENETRATION. SHOT PEENING REMOVES ALL SURFACE IRREGULARITIES LIKE STRESS RISERS WHILE IMPROVING OVERALL EXTERIOR INTEGRITY, QUITE A DIFFERENCE ALREADY. (JOHN)>> NEXT STOP, A FACILITY WHERE ARP CHOMOLY FASTENERS UNDERGO SOME ESPECIALLY CRITICAL MANUFACTURING STEPS, LIKE CENTERLESS GRINDING. THIS INSURES BOLTS AND STUDS ARE PERFECTLY CONCENTRIC. (CHRIS)>> WE GAVE IT A STRAIGHT GRIND, AN UNDERCUT GRIND, AND NOW WE'RE DOING THE TD GRIND. (JOHN)>> MOST ARP BOLTS ARE FILLET ROLLED WITH A 30 DEGREE CHAMFER BETWEEN THE HEAD AND THE SHANK. (MIKE H.)>> THE FILLET ROLL GUYS COME IN AND PRESSURIZE THEM INTO THE HEAD, WITH STRENGTHENS IT. IT REALLY SQUEEZES THE MICROSTRUCTURE OF THE MATERIAL AND GIVES IT A LOT OF FATIGUE STRENGTH. (JOHN)>> FILLET ROLLING FURTHER COMPRESSES THE GRAIN FLOW. THIS ADDS MORE STRENGTH WHERE IT REALLY COUNTS. (JOE)>> CUTTING THREADS WEAKENS THE PART. ARP ROLLS THEIR THREADS, WHICH ALSO ADDS FATIGUE STRENGTH. WHILE ARP HAS A DEDICATED QUALITY CONTROL DEPARTMENT OVERSEEING ACCURACY OF TOOLS, PROCEDURES, AND PRODUCT, WE DISCOVERED THAT WORKERS ON THE FLOOR FREQUENTLY INSPECT AND MEASURE FASTENERS AS PART OF ONGOING QUALITY CONTROL AND COMPANY PRIDE. (MIKE Z. )>> A LOT OF THOSE GUYS HAVE BEEN WITH US FOR MANY YEARS. I MEAN THEY STARTED OUT FAIRLY YOUNG WITH US AND STUCK WITH US. (JOE)>> ARP MANUFACTURES NUTS IN A MULTISTEP PROCESS THAT BEGINS WITH BLANKING EACH HEX AND 12 POINT NUT. THEN SOPHISTICATED AUTOMATED THREADING EQUIPMENT TAPS EACH ONE WITH AN ACCURACY OF ONE THOUSANDTHS OF AN INCH. PETE IS A VETERAN MACHINIST WHO NOT ONLY HELPED REFINE THE NUT MAKING PROCESS, HE ALSO MENTORS YOUNGER, NEWER EMPLOYEES. (PETE)>> I'M HAPPY TO WORK WITH THESE KIDS. I AM HAPPY THAT I AM ABLE TO SHOW WHAT I KNOW. (JOE)>> IN SURFACE PREP STEEL PARTS LIKE THESE NUTS ARE PLACED IN TUMBLERS FULL OF ONE OF FIVE DIFFERENT MEDIA, FROM VARIOUS CERAMIC PARTICLES DOWN TO WALNUT SHELLS AND CORN HUSKS. THE RESULTS, A MICROPOLISHED FLAWLESS FINISH. MOST STUDS AND MANY BOLTS GO THROUGH A MULTISTAGE FINISHING PROCESS AND APPLICATION OF A BLACK OXIDE PERMANENT FINISH. SO ARE THEY TOTALLY FINISHED? (MIKE Z. )>> AT THE END OF THE DAY ALL THE ROLLING, AND FILLET ROLLING, AND GRINDING, AND FORGING JUST GOES RIGHT TO THAT ROOM AND THAT'S WHERE IT'S ALL PUT TO THE TEST. TO ONE MILLION CYCLES. TENSILE TESTING IS SIMPLY PULLING ON A FASTENER UNTIL IT BREAKS. THAT'S AN OEM STUD ON THE LEFT, AND THE ARP HAS A TENSILE STRENGTH OF OVER 190,000 PSI. SO IT'LL BE A WHILE BEFORE IT LETS GO. 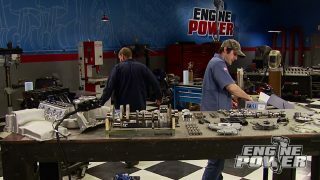 (JOE)>> FINALLY THIS IS WHERE MORE THAN 1,000 DIFFERENT ENGINE KITS ARE SHIPPED TO RACE TEAMS AND BUILDERS AROUND THE WORLD. (ROBERT)>> IT WASN'T ALWAYS THAT WAY. THOSE ARE ALL HARD FOUGHT FOR CUSTOMERS. (JOE)>> SO BUILDING A BETTER BOLT, IF YOU WILL, IS AN ENORMOUS ENDEAVOR. THAT'S WHAT IT TAKES TO KEEP THE MOST POWERFUL ENGINES TOGETHER AND WINNING. (MIKE Z. )>> WHEN YOU FIND WORK THAT YOU ENJOY DOING, YOU DO IT THE BEST YOU CAN. WE'VE ALWAYS LIKE BEING BETTER THAN THE OTHER GUYS. A LITTLE AGGRESSIVE. NOW THIS IS THE LAST STEP BEFORE ALL THAT ASSEMBLY. WE'LL SPRAY A FEW COATS OF DUPLICOLOR'S HIGH HEAT GRAY ENGINE PRIMER SO THE PAINT HAS A GOOD BASE TO STICK TO. NOW APPLY SOME EVEN COATS OF THEIR SEMI GLOSS BLACK ENGINE ENAMEL WITH CERAMIC. IT'S RATED TO 500 DEGREES. TIME TO CLEAR THAT PARTS TABLE, STARTING WITH OUR TRICK FLOW CAM SHAFT. THE VALVE LIFT ON THE INTAKE AND EXHAUST WITH A ONESEVEN ROCKER IS 625. DURATION AT 50 IS 230 ON THE INTAKE, 238 ON THE EXHAUST. NOW ONCE IT'S IN WE CAN ROTATE IT TO MAKE SURE IT SPINS FREE AND THERE'S NO BINDING. THE CAM RETAINING PLATE CAN GO ON NOW FOLLOWED BY THE TIMING SPROCKET. BEING PUT TOGETHER. WE'RE READY FOR ANOTHER PART OFF THE TABLE. IT'S THIS KONE CRANK SHAFT THAT SPORTS A FOUR INCH STROKE AND TWO 100 MAINS. NOW IT'S A 4340 FORGED MATERIAL AND WEIGHS IN AT 52 POUNDS. YOU CAN ORDER IT WITH A 24 OR 58 TOOTH RELUCTOR WHEEL. NOW IT'S A STRONG, AFFORDABLE FOUNDATION FOR OUR PLANS. EARLIER WE SHOWED YOU WHY WE PUT THESE ARP STUDS IN. IT'S ALSO IMPORTANT YOU KNOW THAT THE TORQUE SEQUENCE IS VERY CRITICAL. HERE'S WHY, WHEN YOU TIGHTEN THE MAIN CAP DOWN, YOU WANT TO DO IT IN SMALL, EVEN INCREMENTS SO IT SEATS FLAT. IF YOU TORQUE ONE SIDE TO THE FINAL SPEC BEFORE THE OTHERS, YOU RISK SIDE LOADING THE BEARING AND ALTERING ITS CRUSH HEIGHT. FIRST TO BE TORQUED ARE THE INNER STUDS TO 20 FOOT POUNDS, FOLLOWED BY AN INCREASE TO 40, FINALLY TO THE FINAL SPEC OF 60 FOOT POUNDS. FOR THE OUTERS THE SAME PROCESS, BUT THE FINAL TORQUE VALUE IS 50 FOOT POUNDS. THE SIDE MAIN CAP BOLTS NEED A LITTLE SILICONE UNDER THE HEAD OF THE BOLT TO PREVENT OIL SEEPAGE. THEY GET TORQUED IN ONE PASS TO 20 FOOT POUNDS. WHETHER IT'S ARP BOLTS OR OTHER PARTS YOU SPEND YOUR MONEY ON, IF THEY'RE NOT INSTALLED CORRECTLY, YOU COULD BE ASKING FOR PROBLEMS. NOW TODAY WE'RE SHOWED YOU HOW TO IMPROVE THE OILING SYSTEM AND STRENGTHEN AN LS ENGINE BLOCK. NOW THESE ARE ALL THINGS YOU CAN DO AT HOME TO SAVE MONEY FOR MORE PARTS. SECONDARIES AND ABSOLUTELY NO CHOKE. HEADS, AND COME WITH ALL THE ODDS AND ENDS YOU NEED FOR THE INSTALLATION. NOW YOU CAN ORDER THESE THINGS BARE OR WITH A CERAMIC COATING LIKE THIS. PRICES START AT $184 DOLLARS. THAT'S IT FOR THIS WEEK, WE'LL SEE YOU NEXT TIME.